Winter is here to stay and to avoid you and your family getting sick is one of the priorities, is highly recommendable to be ready with this easy to find ingredients for home remedies and have a winter without the unpleasant cold and flu. The Bulgarian tradition in the subject of home remedies is rich and been pass from generation to generation. is not only good for your health but also it tastes nice! In a small pot you boil some water, then you add the Linden blossoms, 2-3 walnuts with the shells, the peel of an apple, the peel of an onion, and you boiled for around 20 minutes, then you strain the liquid and drink it as a tea with lemon and honey. 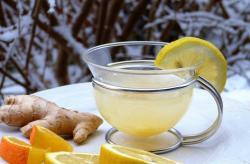 This is a very popular home remedy and many people drink it to prevent possible colds. In a small container, you boil a glass of rakia with two teaspoons of sugar or honey and a bit of black pepper and cinnamon, you drink it worm in small sips. One of Christmas favorites also keeps you in good health for the end of the year celebrations. In a small container, you boil a glass of wine with two teaspoons of sugar or honey and a bit of black pepper and cinnamon, you drink while is still worm in small sips. Especially recommended, great results and suitable for kids. if you want to be healthy all winter grandmas recommend you to take one garlic clove a day (drink it with water like a pill), that is very good for your general condition and keep a strong immune system. You could be a bit heavy in garlic smell, but it works pretty well. Easy to do and easy to drink. To ease the cough, put 1/2 liter of water into 4-5 leaf bay leaves. Boil for 5-6 minutes, then strain and drink. Optionally, you can sweeten the mixture with honey. Remember that is of great importance whenever you start coughing and it lasts for several days, you must visit your doctor and he/she to listen to your chest.